Spotlighting TR: Selections from the Theodore Roosevelt Association Journal, 2007-2014 , edited by William N. Tilchin, will be published very soon, probably in October or November of this year. The table of contents of this handsome hardcover book of more than 600 pages is on the next three pages (4-6) of this issue of the TRA Journal . This is a limited edition book: Less than 400 copies are being printed, and no second printing is anticipated. The retail price of Spotlighting TR is $65. But all copies ordered and prepaid prior to October 15, 2016, will cost only $52 (a 20% discount). A shipping and handling charge of $4 per order (of any quantity of books) will be added. 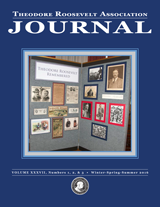 This issue of the Theodore Roosevelt Association Journal is dedicated to the memory of TRA Advisory Board member Chip Bishop, a contributor to the TRA Journal (including an article in this edition, pp. 46-53) and to Spotlighting TR.